Synopsis : Information and articles on caregivers who care for the elderly and persons with disabilities. Carer (UK, NZ, Australian usage) and caregiver (US, Canadian usage) are words normally used to refer to unpaid relatives or friends who support people with disabilities. The words may be prefixed with "Family" "Spousal" or "Child" to distinguish between different care situations. Any person with a health impairment might use caregiving services to address their difficulties. Caregiving is most commonly used to address impairments related to old age, disability, a disease, or a mental disorder. Caregivers are people who take care of other adults, often parents or spouses, or children with special medical needs. Some caregivers are family members; others are paid. Proper home care training is more important than ever for those who work with the elderly, as increasing numbers of older Americans are staying in their own homes or moving to some sort of assisted living environment. With an increasingly aging population in all developed societies, the role of carer has been increasingly recognized as an important one, both functionally and economically. Many organizations which provide support for persons with disabilities have developed various forms of support for carers as well. 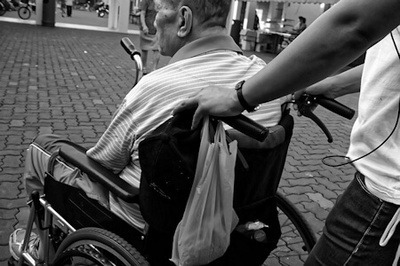 Black and white photo of a man in a wheelchair being pushed by his carer. In the United States today there are approximately 50 million people who are caring at home for family members including elderly parents, and spouses and children with disabilities and/or chronic illnesses. Without this home-care, most of these cared for loved ones would require permanent placement in institutions or health care facilities at great cost to our society. Close to 80% of all long-term care is now provided at home by family caregivers to children and adults with serious conditions, including mental health issues, amyotrophic lateral sclerosis (ALS), multiple sclerosis (MS), traumatic brain injury, cancer, paralysis, developmental and physical disabilities, cognitive impairments and Alzheimer's disease. Parents and family caregivers are the backbone of the long-term care system and save health-care insurers and governments billions of dollars annually. According to the American National Family Caregivers Association (NFCA), more than one quarter (26.6 percent) of the adult population has provided care for a chronically ill, disabled or aging family member or friend during the past year. Based on current census data, that translates into more than 50 million people. Around half of all carers are effectively excluded from paid employment through the heavy demands and responsibilities of caring for a vulnerable relative or friend. Their work has huge economic and social impact. Individuals who are interested in home care training should contact their local hospital, counsel on aging or community college to inquire about home care training programs in their area. There are also some training programs offered online as well as through faith-based organizations such as churches and synagogues. 18% of children 8 to 18 years old provide unpaid care for someone (Alzheimer's Association, 2009). 10% of family caregivers of people with Alzheimer's disease or an other dementia are doing so long distance. The average age of a caregiver to a person with Alzheimer's disease or other is 48 years old. (Alzheimer's Association, 2009). The vast majority (87%) of individuals with Alzheimer's disease are cared for at home by family members (Alzheimer's Association, 2009). For Alzheimer's disease alone, in 2008 there were an estimated 9.9 million caregivers providing 8.5 billion hours of care at a value of $94 Billion dollars (Alzheimer's Association, 2009). Caregivers provide assistance to a person with Alzheimer's disease or other dementia who is their parent or parent-in-law (57%), grandparent (11%), or spouse (6%; Alzheimer's Association, 2009). An estimated 25-29% of caregivers of persons age 50 or older provide assistance to someone with a cognitive impairment, a memory problem, or a disorder like Alzheimer's disease or other dementia (NAC, 2004). An estimated 21% of households in the United States are impacted by caregiving responsibilities (NAC, 2004). More than 34 million unpaid caregivers provide care to someone age 18 and older who is ill or has a disability (AARP, 2008). The typical caregiver is a 46 year old woman with some college experience and provides more than 20 hours of care each week to her mother (NAC, 2004). Half (53%) of caregivers who said their health had gotten worse due to caregiving also said the decline in their health has affected their ability to provide care (NAC, 2006). Caregivers report having difficulty finding time for one's self (35%), managing emotional and physical stress (29%), and balancing work and family responsibilities (29%) (NAC, 2004). The out-of-pocket costs for caregivers who are caring for someone who was age 50 or older averaged $5,531 in 2007. About 37% of caregivers for someone age 50 and older reduced their work hours or quit their job in 2007 (AARP, 2008). Caregivers said they do not go to the doctor because they put their family's needs first (67% said that is a major reason), or they put the care recipient's needs over their own (57%). More than half (51%) said they do not have time to take care of themselves and almost half (49%) said they are too tired to do so (NAC, 2004). Yelp Reviews of Nursing Homes Tend to Focus on Staff Attitudes and Responsiveness - University of Southern California study finds Yelp reviews of nursing homes tend to focus more on staff attitudes, staff responsiveness and the physical facility itself than government reviews. Caregiving by Family Members and Other Unpaid Individuals - Researchers examine characteristics of unpaid caregivers and note health-related tasks caregivers provided, and how caregiving affected care providers. Film Highlights Absurdity of 15 Minute U.K. Care Visits - Satirical film starring Claire Sweeney highlights the indignity suffered by thousands of elderly people because of 15 minute care visits. Delays in California Caregiver Payments Hearing - For years, California state has been hearing complaints that carers state-issued paychecks are often delayed for days or weeks in the In Home Support System. Citation: Disabled World. (2019/01/13). Caregivers: Services and Information for Carers. Retrieved 2019-04-22, from https://www.disabled-world.com/disability/caregivers/ Direct Link: Caregivers: Services and Information for Carers - Information and articles on caregivers who care for the elderly and persons with disabilities.